The Garden City is a great place to live, work and play. Over the years, our community has shown how important it is to be a smart, vibrant place that plans and acts for all of our citizens. As you may recall, in January 2015, Missoula city and county governments joined forces with 13 other local businesses and organizations to invest in a three-year Zero-Fare demonstration project with the goals of removing barriers to riding public transit, helping buses operate more efficiently, and increasing Mountain Line ridership for the overall health of our community. By all measures, the Zero-Fare project has been an incredible success, demonstrating how thoughtful public investments can be leveraged with private donations to achieve important community goals. By December 2017, transit ridership had nearly doubled in Missoula, increasing an incredible 70 percent, from 900,000 to more than 1.5 million rides per year. This surge occurred primarily in response to the Zero-Fare program, as well as new, high-frequency 15-minute (Bolt!) routes and expanded evening service. Mountain Line has succeeded in replacing the lost revenue from transit fares (which only comprised 9 percent of the budget), and the agency is now spending less per passenger than at any time in our history. 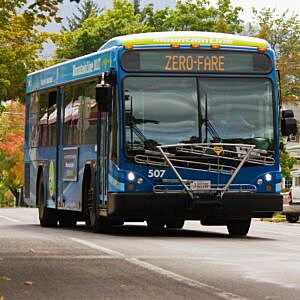 The Zero-Fare partnership has been so successful that all of Mountain Line’s Zero-Fare partners have agreed to continue the program until 2020, and the partnership has grown in numbers. The ridership gains achieved through Zero-Fare have also been essential to securing millions of dollars in federal grants for six new electric buses and upgraded transit facilities. Lack of funding for Mountain Line’s Bus Stop Master Plan had been a barrier to improving our transportation system for the past several years. However, we recently received a Bus Facilities Grant and without the ridership increases we’ve seen through Zero-Fare, it’s unlikely Missoula would have been competitive for these grants. To our knowledge, Mountain Line is the only transit agency in the country that has received both a Low-No Emissions grant and a Bus Facilities grant in the same funding cycle. It’s through the support of our partners that such successes are possible. Mountain Line and our Zero-Fare partners continue to believe a strong public transit system is the sign of a healthy and vibrant community. Public transit benefits all residents and visitors, even those who may not jump on the bus. By reducing the number of vehicles on the roadways, transit reduces traffic congestion and parking demand and improves air quality for everyone. Mountain Line buses help students get to school, employees get to work, and keeps seniors and those with disabilities active, mobile and independent — we all benefit when some of us ride the bus! The current list of Zero-Fare partners includes the University of Montana, ASUM Office of Transportation, Providence St. Patrick Hospital, Community Medical Center, the City of Missoula, Missoula County, the Missoula Parking Commission, Missoula Aging Services, Missoula Downtown Association, Southgate Mall, the Missoulian, Homeword Inc., Destination Missoula, Missoula Federal Credit Union, MMW Architects, Missoula Food Bank, and Windfall Inc.
Mountain Line is launching an ambitious “40 for 40” campaign to grow our list of partners to 40 by the end of 2018 in honor of our 40th anniversary of service. We thank our city and county government leaders for their continued participation in this initiative, demonstrating that our local officials are committed to making transportation accessible and affordable for all. For more about how your business can become a Zero-Fare partner, contact info@mountainline.comtoday. And thank you to all whose thoughtful decision-making continues to make Missoula and surrounding areas simply great. Amy Cilimburg and Doug Odegaard are members of the Missoula Urban Transportation District Board of Directors.